3 Hot or cold tea? Tea (Camellia sinensis) is an ancient beverage native to southern China, which has become a cultural symbol and it is being used for medicinal purposes. Currently, it is estimated that about two thirds of the world’s population drink tea every day. Gunpowder green tea. We will see the rolled leaves, a sign of quality. The most important thing to prepare an authentic tea is to choose a quality supplier. In Western countries the use of tea bags is widespread, because they are comfortable and quick to prepare. However, most tea bags that we buy in supermarkets are of very low quality because they contain ” tea powder “, that is, very small leaf particles, which do not retain the authentic flavor of the plant. 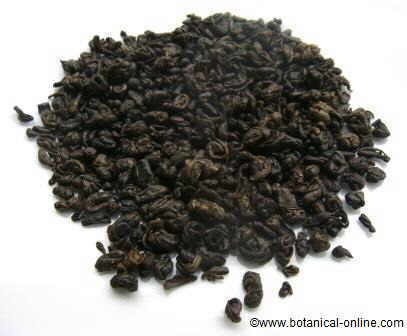 Tea experts recommend buying good quality tea or the highest qualities at retail stores . They must be infused and, then, they must be strained. In case you want tea bags, it is advisable to choose a brand with quality assurance. – Infuse at 80-90 º C a teaspoon of tea leaves (2 – 4g.). 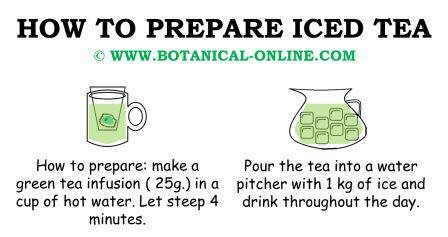 – Cover and let stand from 2 to 7 minutes, depending on the type of tea. Tea should be subjected to hot water because, doing in this way, it can release into the water all its components and aromas. Tea infusion never should be done in boiling water as tea components would be destroyed and aromas would be lost. – Black tea, red tea, oolong tea and the infusion Rooibos should infuse at a temperature of 90-95 º C. This is the temperature at which most herbs are infused, before the water gets the boiling point. – White tea and green tea are more delicate and should infuse at 70 º C to preserve all its properties. During the first 1 or 2 minutes the 75% of the caffeine in tea is released. After these two first minutes, tannins and other polyphenols, as theaflavins and thearubigins, are released, giving the infusion a little bitter and astringent taste, and a more red color. It is not recommended more than 5 minutes of tea resting, because you would obtain a very strong and bitter taste, especially in case of black tea. Some teas can be drunk hot and cold. The only difference is that, if we take them cold, we will have to add twice the amount of tea in each infusion, and serve it in a glass with ice. Never add milk to green tea and white tea (traditionally). Japanese teas: Sencha, Bancha, Kukicha, Genmaicha, Gyokuro, etc..
Black tea can be taken with or without milk. Because of its bitterness, you can add sugar or lemon. Some blends (mixtures of tea) as English Breakfast or Earl Grey are typically served with milk. Rooibos infusion can be taken with or without milk. Traditionally, some teas (those of higher quality, superior quality or premium) are used throughout the day. This applies, for example, to Japanese tea Gyokuro. Japanese people prepare throughout the day infusions of the same tea leaves. It consists simply on discarding the water after the first infusion and making another one with the same tea leaves. Because during the first two minutes 75% of the caffeine in tea is released, the second time that tea is prepared, we get a drink with less caffeine. Another option is to opt for decaffeinated teas such as Rooibos.